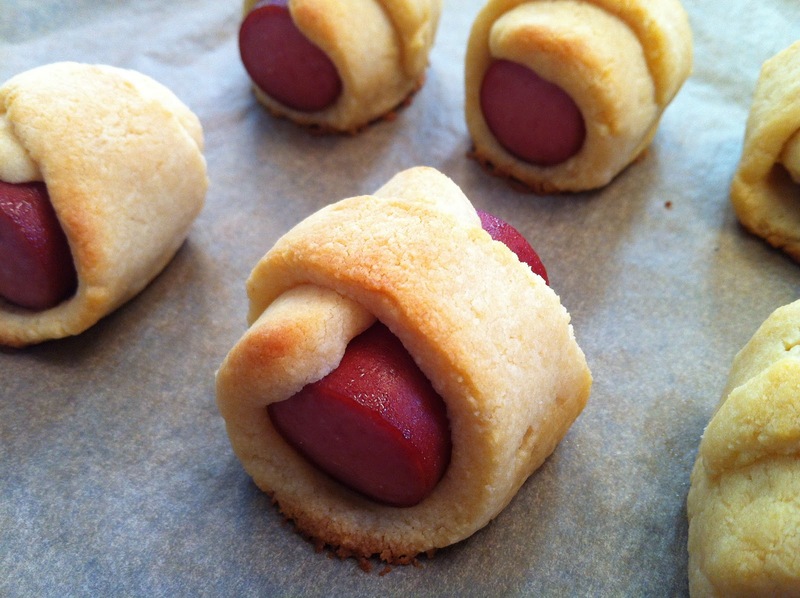 pig in a blanket | what is clara eating today? Mix all the ingredients (except for beef franks) in a small bowl. Pour onto a parchment paper and cover with another parchment paper. Roll out the dough to 1/3 inch thick (about 1.5in x 6in). Cut into three long triangles. Move one of the triangles to a parchment paper and put a beef frank on top and roll the dough around (use the parchment paper to help you roll the dough-like sushi- since it can easily fall apart. if there are any cracks, i just pat them gently). Do this for all three. You can prepare ahead up to this point. refrigerate up to one day (haven’t tried longer). Bake at 325 for 10-12 minutes. Let it cool completely before moving, otherwise the “blanket” will fall part. Great to pack as school lunch!